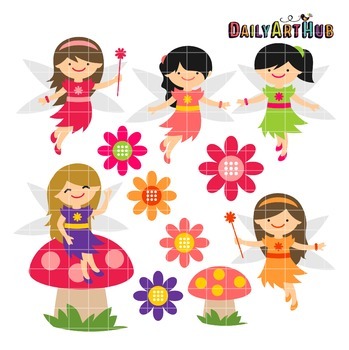 Spring Time Fairies Clip Art - Great for Art Class Projects! Each clipart illustration is included separately as a high-resolution PNG file with a transparent background and also as a JPG with a white background. Also includes each file in SVG format perfect for cutting machines. Each object is provided at sizes of 5.5 Inches on its longest side. The PNG makes it versatile to scale for any project. No watermarks will appear on purchased items. No additional licenses are required, however, credit back to my store is always appreciated.